No one won in this experience, and I was certain there was a better way. This year, our Coordinator of Pedagogy and Faculty Development, Mrs. Vermeeren, initiated a new program in our school called OBIO— Observation by Invitation Only. The goal of this approach is to promote and celebrate innovation in our school’s classrooms while putting the teacher and administrator at ease in order for the observation to yield substantive feedback for professional growth. This was our better way. Ahead of the visit, each teacher created a lesson involving something that he or she had not yet tried in the classroom— an unfamiliar methodology, untested activity, or new use of technology. Like any good observation, there was a pre-meeting to discuss what the teacher wanted to have noted or measured in the observation. The teacher then invited an administrator to observe the lesson on a mutually agreed upon day. 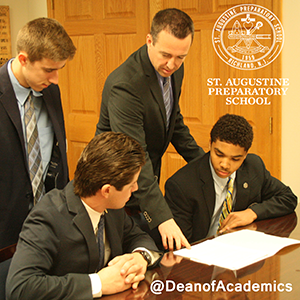 Because these formative steps had taken place, the administrator felt welcome during the observation. The teacher benefited too, feeling supported and not on display. As a result, the follow-up meeting became much more engaging and helpful. Great teachers are innovative. 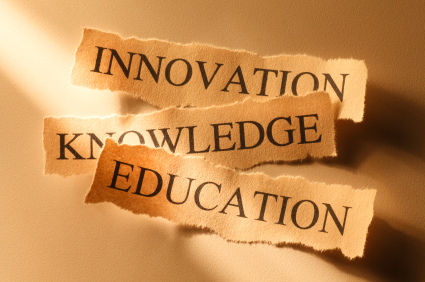 In education today, we too often presume that innovation must be bound to technology. I do not think that it needs to be; however, the use of technology is, more often than not, the best way to reach and relate to this generation of high school students. Highlighted below are a few of the OBIO lessons that used technology particularly well to engage students and to enhance learning. It should be noted that there is impressive diversity in these faculty members’ ages, experiences, and professional backgrounds. Mr. McHale designed this lesson to help his students understand how visual processing occurs by using optical illusions to disorient visual pathways. Utilizing their iPads, the students viewed optical illusions via the digital labs on Brown University’s website. Students discussed what they saw and answered higher-level questions to check for understanding. Mrs. Wittman has made it a personal goal to use less paper in her classroom, and this was an impressive paperless lesson. Mrs. Wittman had the students use Google Classroom and Notability to complete “Grammar Bell Ringers.” The assignments were uploaded to Google Classroom and shared with the entire class. This class utilized Nearpod to teach special right triangles. The lesson allowed for the entire class of freshmen and sophomores to fully participate and demonstrate their understanding of the material. Using technology, Mr. Gonzalez was also able to reinforce note-taking skills as geometrical concepts were introduced. The diversity in the above lessons and in the teachers who created them is evidence that technological innovation is not limited to the recently-graduated, computer-minded iTeacher. These are just four of the many innovative lessons that were created. Thankfully, I work with an open-minded, devoted faculty who strive for excellence every day. They recognize that all teachers must embrace innovation— if not with technology, then with methodology. Our students deserve it.